This entry was posted on 01/21/2014, 9:34 and is filed under Uncategorized. You can follow any responses to this entry through RSS 2.0. You can skip to the end and leave a response. Pinging is currently not allowed. Ok. I can only imagine the money that exchanged hands for that. 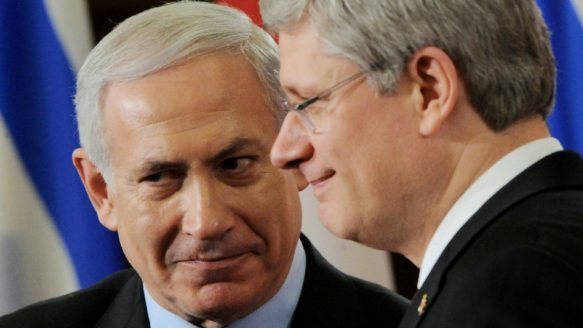 Harper bending over and taking it up the rear from Bibi. His groveling makes Obama look like a statesman. What an embarrassment for Canada. No-one cares what the Canadian Zionists think, especially a droopy dog creep like Harper. Adbusters magazine warned about this stooge years ago. I believe the majority of Canadiens do not support the likes of Harper, also seeking justice for Palestinians and holding israel accountable for its actions is not antisemitism, these dopes can spin it and glad hand each other and swap spit over it all day in the shower if they want but it does not make it so. Does anybody have a clue about the sanctions against Iran? What are they exactly? We must judge Harper not by the Canadian policy, but by his acts. He has a forked tongue! There are dis-info agents out there claiming Zionism is not Judaism.How can they be separated if both share the fundamental believe that Canaan/Palestine was “given” to them and that they were “chosen” to rule over [or annihilate] all other peoples? Even the few jews who object to “Israel” only do so on a technicality,that is HOW that state was established. ISRAEL: AN APARTHEID & TERRORIST STATE: More than 200yrs ago, Thomas Jefferson declared that every nation must act with a “decent respect to the opinions of mankind”. Israeli leaders have never accepted the wisdom of this maxim. They adhere to the dictum of a racist fanatic David Ben-Gurion: “It is not important what the Gentiles say, it is important what the Jews do.” Perhaps he assumed that Jews would not act foolishly. People are sick & tired of listening to BS by Zionist that Palestine belongs to them according to Biblical scriptures. 3000yrs ago they were driven out of that land another C&B storey. Old Testament or not, the Jews had no right to go to Palestine to kill the Palestinians and drive 750,000 from their homes to create Israel in 1948. Because of their prior ownership they are mocking God by butchering Palestinians and treating them worst than animals with money and weapons received by blackmailing America to reclaim their Holy Land. It was an International Crime with American & European support to make a nation for those people whose ideology consisted of racism, supremacy, and expansionism and nothing can be said to justify it. Any one who claims that Israel is the victim not the aggressor; is nothing but fiction, hocus pocus, misrepresentation, half truths, omissions and out right lies. Those who says that Israel stands tall as a beacon of Democracy in an otherwise dark middle east where oppression and slavery are norm are insulting every democracy around the world. Since Israel has been forcibly occupying Palestine since 1967 and doing human genocide of Muslims; I do not hesitate to classify Israel as an apartheid and terrorist state. Harper is a total embarrassment. Yup, he must have picked up a nice cheque for this. I wonder if he will share with his gay wonder boy Beard. When does this shill come up for re-election? Or is it like in the US where you can’t even run unless you’re a bona fide shill?